Denver City Council: Preserve immigrant rights. Williams: More deportations! 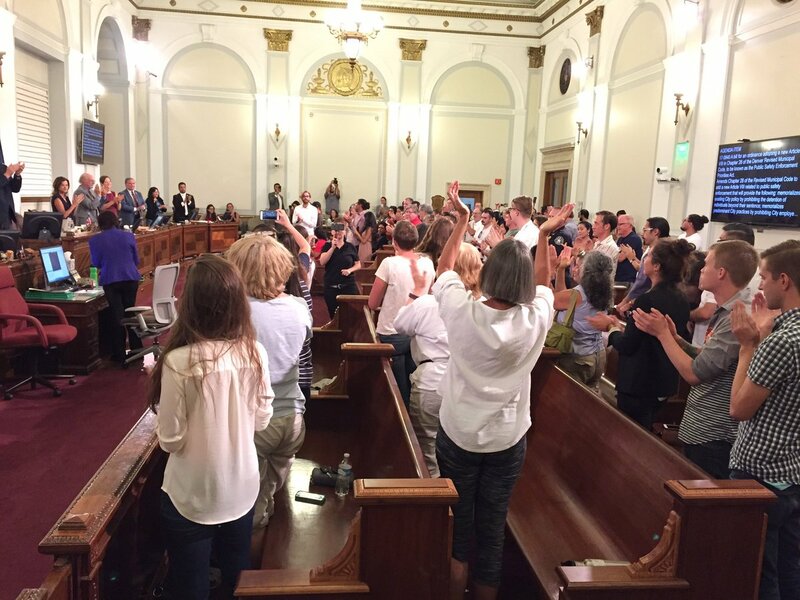 Denver City Council Chambers were packed Monday night with an overflow crowd, wearing white to show support of immigrants and refugees, cheering Denver City Council’s passing of the Public Safety Enforcement Priorities Act. (PSEPA) The PSEPA ordinance codifies a “Don’t Ask, Don’t Share” policy for requesting immigration documents, while also preserving exceptions for violent or wanted criminals, and provides for notifying ICE when detainees “of interest” are released. PSEPA is viewed as a compromise which preserves immigrant’s Constitutional due process rights, while also protecting public safety. It is the result of months of negotiations between city officials and immigration rights activists. While Denver City Council was debating this compromise legislation, HD15 State Representative David Williams wrote to President Trump and AG Sessions, claiming that Denver is not deporting enough people, and detention / deportation needs to be increased. Williams has called for an investigation into “sanctuary city politicians”, including Denver Mayor Michael Hancock. Williams’ letter, released Sunday, per reporting by Kasey Kershner of KRDO News13, asks for federal intervention concerning illegal immigration in the Denver area. It specifically calls out Denver City Council’s PSEPA ordinance as a “sanctuary city ordinance”. ICE (Immigration and Customs Enforcement) has detained unprecedented numbers of people all over the country, resulting in 793 people being deported as of May 2017 in Colorado and Wyoming, up from 670 in 2016. Many more are being held in virtual concentration camps in Aurora and other locations, forced to work as slaves for the county, without being charged nor convicted of any crime, except that of lacking documents to be in the United States legally. These private, for-profit prisons are supported with your taxpayer dollars, and may also be defended with your taxpayer dollars from class-action lawsuits about their free-labor practices. Deportation and hatred of all immigrants has been the one policy Trump has promoted which has been “successful” – if “success” is defined as breaking up families and arresting 35% more people in Trump’s first three months in office – because immigrants tend to stay in the shadows, doing menial labor and not making waves. Immigrants are exploited for their labor, and easily scapegoated by unprincipled right wing politicians such as Representative Williams. Jon Murray’s consistent reporting on this issue in the Denver Post has contributed to public understanding of the complex immigration issues. Kudos to Denver City Council, and to Mayor Hancock, for doing the right thing to protect Constitutional rights and due process under law. Teacher in northern Colorado. Nosy, curious, persistent. What's missing here is just how do persons who are not citizens become entitled to "constitutional due process rights?" This article provides some of the long history of Constitutional rights for non-citizens on US soil. It is not controversial – except for those who don't like it. If you read the Constitution, it usually refers to "persons" not "citizens." So when the 14th Amendment says "nor shall any State deprive any person of life, liberty, or property, without due process of law; nor deny to any person within its jurisdiction the equal protection of the laws," it applies to all persons, not just citizens. Same with the Fifth Amendment. Not affording due process rights to non-citizens would violate the text of the 5th and 14th. Even dead Scalia recognized this. CHB, were you trying to be obtuse. You're usually smarter than that. spaceman and realist have covered the salient points – the Constitution's 5th and 14th amendments cover "persons", not "citizens". "Persons" have rights to due process – can't be detained, locked up, forced to work, tortured, subjected to hardship and abuse without being charged and convicted of a crime. Being without legal documents is a misdemeanor, (improper entry) not a felony. Unlawful presence (such as Mrs. Trump's overstaying her modeling work permit visa) is also not necessarily a crime, could result in deportation, but again, persons are constitutionally protected from incarceration and abuse. Sorry for the delay in answering – school district takes a dim view of my blogging on the taxpayer’s dime. Great writeup, mama. Thanks. Williams is such an epic douchebag.